From the Mandarins Web site: The Mandarins were featured at the 13th annual Pacific Rim Street Fest on May 22 in Old Sacramento. The event is a celebration of Asian heritage. 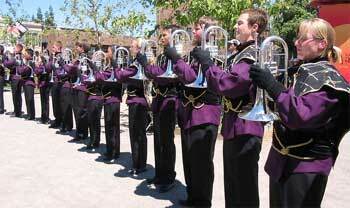 Under summer-like skies, the corps played their 2005 repertoire to an estimated 50,000 people. The festival shares the diversity of many Pacific Rim traditions through art, food, and entertainment, while enhancing the community's knowledge of Asian/Pacific Island cultures.